Looking to rebound from their loss to Montezuma, the L-S boys traveled to Colfax Tuesday night, Dec. 13, to take on the Tigerhawks. After only leading by two at halftime, the Hawks used a second-half surge to beat Colfax-Mingo, 68-38. 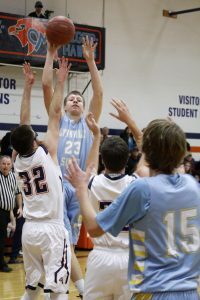 The Tigerhawks only managed to score nine points in the second half as the Hawks stepped up their defense. The L-S boys forced Colfax-Mingo to commit 18 turnovers on the game, compared to their six. The Hawks also had 14 steals on the night. Jesse Van Wyk manages to put up a shot under pressure from the Tigerhawk defense. The junior totalled 12 points last Tuesday, Dec. 13. The Hawks had a good night on the boards as well, out-rebounding the Tigerhawks 33-20. L-S also had 18 assists for the night on 24 made field goals. "We let Colfax-Mingo keep it close at halftime, and we knew we had to step it up at halftime in order to get a victory. 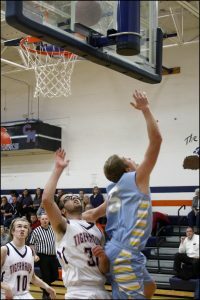 We came out and played really good defense, and that propelled us to a victory," said junior Brevin Hansen. Junior Tanner Foster was the leading point scorer for the Hawks. He put up 14 points and was also the leading rebounder with nine boards. Hansen and fellow junior Jesse Van Wyk both had 12 points on the night while Van Wyk had six rebounds. Senior Tyler Van Zante had nine points and pulled down five boards while sophomore Rylan James also had nine points with four rebounds. Senior Ryan Hofer and sophomore Tyson Vander Linden both had five points, and Hofer pulled down six rebounds. Ryan Hofer passes the ball to Tanner Foster over outstretched defenders’ arms. Hofer and Foster both had a good night for the Hawks who beat Colfax-Mingo by 30 on the night.